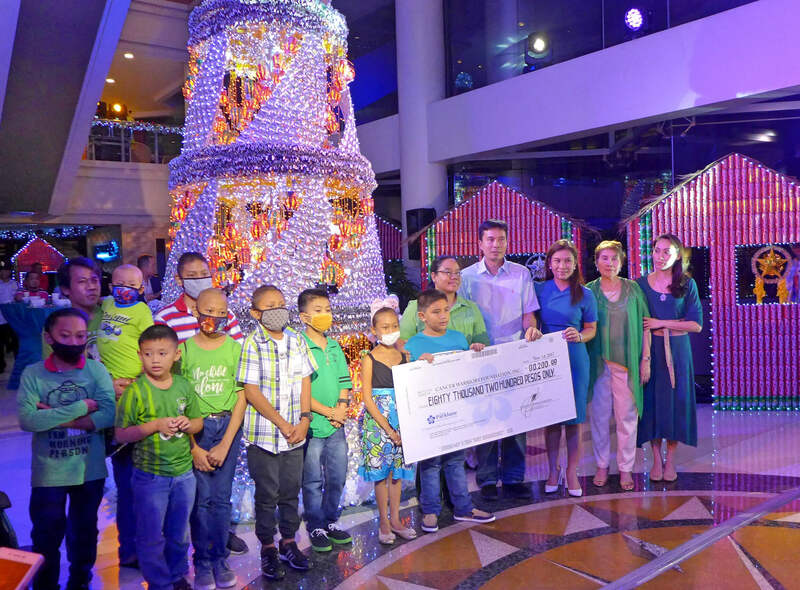 Cebu Parklane International Hotel gives more meaning to a traditional Christmas celebration by lighting a beautiful tree made purely out of recycled materials and starting a fundraising campaign for kids with leukemia. The celebration of Christmas is about giving life and hope, and the hotel aims to do both this festive season, said Parklane general manager Cenelyn Manguilimotan. LIGHTING THE TREE. Cebu Parklane International Hotel officials led by general manager Cenelyn Manguilimotan (3rd from left), former Department of Tourism 7 director Dawnie Roa (center), and Cebu Vice Governor Agnes Magpale toast the lighting of the Christmas tree at the lobby. “For past five years, Parklane has embarked on a campaign to go green. We have used water bottles and other trash we’ve collected to make beautiful things,” she added. Parklane lights up a towering tree made out of Coca-Cola tin cans last November 14, also as a way of showcasing its partnership with the beverage company. Coca-Cola will donate a chemotherapy vial for sick children helped by the Cancer Warriors Foundation for every trinket sold through the hotel’s “I can go green, I can save lives, I can because of a can” Christmas 2017 campaign. HELPING THE KIDS. Cebu Parklane International Hotel officials hand over a mock check to signify its donation of funds to help the treatment of children with cancer through the Cancer Warriors Foundation, Inc.
Manguilimotan said kids with leukemia have the highest chances of surviving the cancer. Vice Gov. Agnes Magpale was among the hotel’s tree-lighting guests. The hotel served a delicious spread of its unique take on favorite Cebuano food, including pungko-pungko and street food fare like fishball and squidball, during the well-attended event. TREE LIGHTING. Cebu Vice Governor Agnes Magpale speaks during the lighting of the Christmas tree. Parklane general manager Cenelyn Manguilimotan.